In This Edition: 6.2b12 Ships Thank You Subforms Posting Preview Batcave! 8 June 2012 — A picture may be worth a thousand words, but there’s no single image that can adequately explain why we missed our self-imposed ship date of May 10th for Preliminary Release 12 of Helix 6.2. Since the release of Preliminary Release 11, as our frustration mounted, so did the pile of words we spilled in anticipation of the next release. But nothing in that pile will ever appear in The Latest Word because, in the final analysis, the story is simply too horrible — and too technical — to tell. The long and the short of it is that we were blind-sided by the programming equivalent of the late spring snowstorm that blanketed our corner of the world nearly two months ago. These snowstorms can be blinding, and this one was no exception. As the winds blow and the snow piles up, there are only two certainties. One is that you have no idea how long it will last and how deep it will get. The other is that when you finally fix it, no one will really be able to tell that you’ve made any progress because everything will appear almost exactly as it was before the snow started to fall. All of which is just an attempt to put a literary face on a fairly common software issue. The snowbank always requires infrastructure work. Like having a part replaced in your car, it still looks and feels like the same car when you finally get back behind the wheel. There are often several ways to fix the problem at the heart of a software snowbank, each with its risks and rewards. We always try to find the best one, which, in this case, was clearly the one that would cause more problems than it would solve in the short run. We opted, as we pledged long ago, to forego the quick fix and do the hard work now, knowing full well that it could take weeks before we had a stable, reliable Helix RADE again. If you signed up for the Europa Pioneer Plan using the monthly payment option, your May payment of $20* has already appeared on your card statement, and you recently received an email telling you the release of Preliminary Release 12 would be delayed. Today, both Monthly and Annual Plan members received an email containing a link to download Preliminary Release 12. If you haven’t read your email yet, or somehow missed it, you can also get Preliminary Release 12 by logging in to our web store and checking your current licenses. It’s easy, after what we’ve just been through, to forget what we’ve accomplished, the excitement we felt a little more than a month ago when we got the graphic user interface controls for subform and posting setups to work on the view icon in Design Mode. But it’s impossible to forget that as bad as this recent storm was, we never could have made it through without your ongoing support. First, unlike the previous Europa releases, this one is permanently enabled — you won’t see any of those dialogs nagging you to update, and if you cannot wait any longer for macOS RADE to be finished, or you want to get back on the sidelines and let someone else pay for the rest of it, we’ll understand. We appreciate your help in getting us this far. Over the last year your support of the Europa Pioneer Plan has helped us take Helix RADE from an application that could do little more than show you the contents of the collections and relations to one that lets you create icons and — partially for some, completely for others — define them using the properties familiar to all Helix collection designers. And User Mode, of course, works like a charm, so this product, while still not 100 percent complete, is fully functional and is yours without expiration. The second way is tied to a common software industry practice, the placement of a fairly ubiquitous device known as an “Easter Egg.” Easter Eggs are essentially little treats hidden in the code that serve no real purpose other than to provide delight in their discovery, letting you see something normally unseen, an “undocumented feature” of sorts. Helix has always had at least one Easter Egg tucked away in it, and we’ve kept that tradition going. But we’re going to break one tradition today and tell you — just this once — how to find our Easter Egg. All you have to do is hold the option key down on your keyboard while choosing “About Helix RADE” from the Helix RADE menu. Look around and you’ll find something you don’t normally see in there. You can read the Preliminary Release 12 Release Notes to get the details on the minor improvements and bug fixes, but in today’s edition of The Latest Word, we want to talk about the big features of this new release. In Preliminary Release 11, we showed you how the Inspector had evolved to deal with the many complexities of a complete view setup. But a few key pieces of that vision were still missing: you could specify a template, but if the template contained subforms, you were stuck. And you couldn’t attach a posting icon to a view either. And entering data in that release was somewhat unstable for some users. But now, a month after we originally planned on putting it into your hands, this new release makes the view icon a fully functional part of the macOS RADE graphic user interface. Preliminary Release 12 also fixes a number of bugs, makes a number of general improvements to the user interface, and improves the Inspector so that most property changes are reflected immediately in the icon’s open window. In setting up a view, you can now really see all these improvements in their full glory. You can now link subforms in a logical and elegant way, and you can attach posting icons to the four ‘trigger actions.’ And to top it off, you can actually preview what the finished product will look like and how it all works before you commit to keeping it. 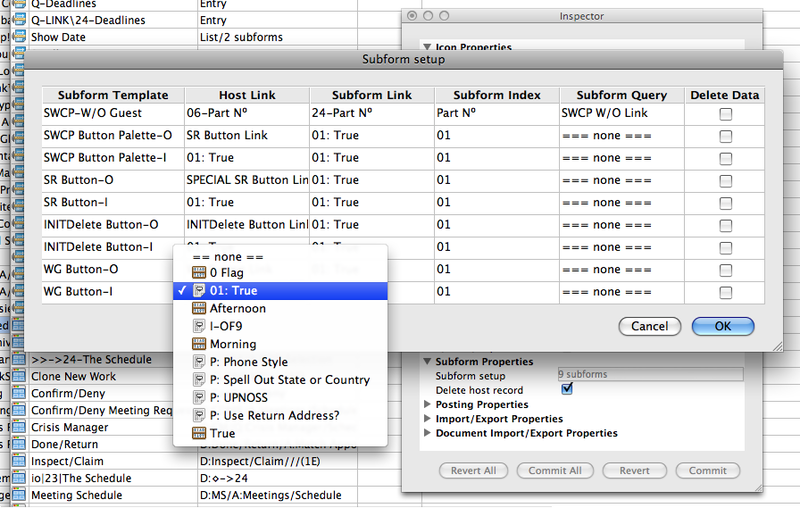 The image on the right shows the dramatic change in how subforms are linked in macOS RADE. When you click the Subform Setup button in the Subform Properties section in the Inspector, this dialog appears, giving you control over every aspect of subform specification. Each subform template is shown on its own line, much as it was in Classic RADE, but without the annoying clipping that happened when working on a view with many subforms. Instead of ‘chasing marching ants around in a circle’ as you did in Classic, you can now read across a single line to see the setup for each subform. Incomplete lines are highlighted in red (not shown in this illustration). We also eliminated a little bit of ‘sleight of hand’ that Classic Helix RADE did when setting up a view with subforms. As any collection designer knows, in order for a field or abacus to be available as a subform link, it must also be indexed. The reason for this is that the link is really to the index, not to the field or abacus you selected. In Helix RADE 6.2, this charade is exposed, and you create the link by choosing the Subform Index instead of the Subform Link. Once colored shading has gone away, all subforms have been properly linked and the view can be opened and used. But before doing that, you may want to do two more things: specify a subform query and decide what happens when records are deleted from a view with subforms. Both functions are logically accessed in this same dialog. In the Classic subform setup window, the top of the second column contained switches to attach an abacus query, form query or power query to the view. This is now done in the Inspector: in the “View Properties” section, the “View query” popup lists all available query icons for the view. Some users never realized that the same capapbility also exists for each subform. This “subform query” acts as a secondary restriction in addition to the “host link equals subform link” restriction. That capability is now clearly shown. The other missing piece in last month’s macOS implementation of the view icon was the ability to assign post icons to any or all of our four triggers. 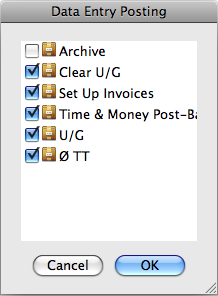 Specifying posting triggers in Classic was often an exercise in frustration, particularly if you were in a hurry. If you didn’t remember to hold the shift key down before you started clicking, all of the other posts in that column would be deselected! And once that happened, there was no way to get the selections back other than to revert to the last time you had saved the collection or to attempt to reconstruct the setup from memory. 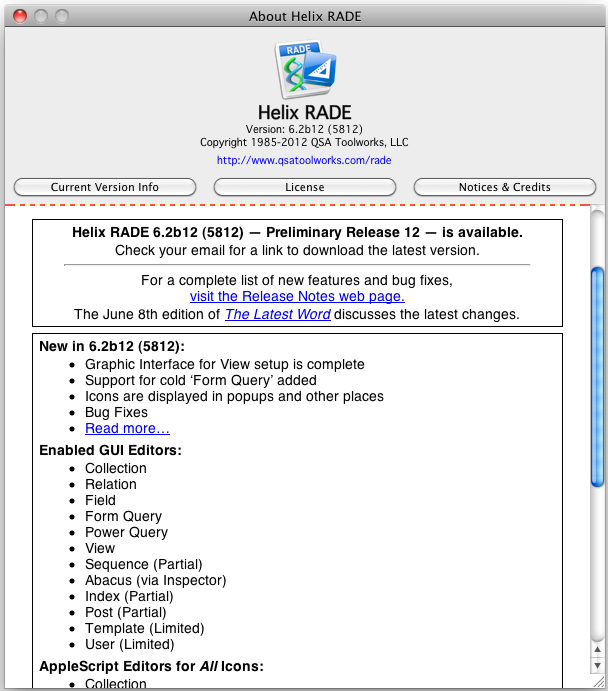 As with every other aspect of Helix RADE for macOS, the methodologies continue to evolve. Today’s implementation is the first visible step in the re-imagining of how posting is specified in macOS RADE. When a view is selected (or open), the Inspector includes a Posting Properties section. Each trigger — On Edit, On Demand, On Print, On Export — appears with an indication of how many posting objects are attached to it. This screenshot shows the dialog that appears when one of the posting triggers is clicked in the Inspector. As you can see, this dialog is quite simple and intuitive. You select the checkboxes next to each posting object you wish to apply to the view and then click OK. Should you change your mind, just click Cancel and your old posting setup is restored. We saved for last what for many will be the best: the fulfillment of the promise of the “Revert Icon” command in Classic RADE. 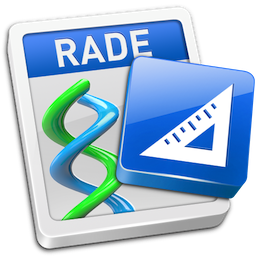 In Classic RADE, the only icon that actually allowed you to make changes and then revert to the old setup was the template. In Helix RADE 6.2, that concept is being applied to every icon type, but we wanted to describe the new subform and posting setups first because the view icon you are getting today really shows off the final big feature of this release: the ability to preview almost any change before committing to it and then having the option to revert if necessary. A “changed but not committed” view works the same as it will after the commit is done. This lets you preview the effect of your changes, avoiding the unpleasant surprises we’ve all fallen prey to at one time or another. Once you’ve worked with this new freedom and flexibility, once it becomes part of the way you work with Helix, you will feel a renewed sense of security in how you work in Design Mode. Finally, we want to apologize again for the delay in getting Preliminary Release 12 out, especially to those of you, who, like us, are almost irrationally devoted to Helix RADE in whatever form you know it, be it Helix Express, Double Helix or even just plain old Helix. But even the most stalwart supporters sometimes wonder whether Helix will survive. If those thoughts cross your mind, remember that Helix is still here, nearly 30 years later. Helix has survived many pains along the way, and the current one has been particularly drawn out. But we are so close to the end! This is not the time to give up! No matter what the circumstance, Helix has always survived, even when the darkest hour seemed darker than usual. In the 1960s, when the American Broadcasting Company turned Batman into a campy TV show for kids — cue the theme song in your head if you know it — every ‘adventure’ was split into two episodes. At the end of the first show, Batman and Robin would be in a dire predicament, facing certain doom. At that point, the narrator would intone: “Have the forces of evil finally won? How can Batman escape? Is this the end? Tune in next time; same Bat-time, same Bat-channel.” Of course, Batman always escapes the trap and returns to vanquish the arch-criminal-of-the-week. As is the case almost every time we meet on this page, that’s where we’re at today: the first year of the Europa Pioneer Plan has come to an end, but there is more work to be done before the graphic user interface is complete. What will happen? Will our hero survive? Is this the end? Tune in next time… but the next chapter in our saga has already been written, so stay tuned. This time, we won’t make you wait even another week before continuing our story.